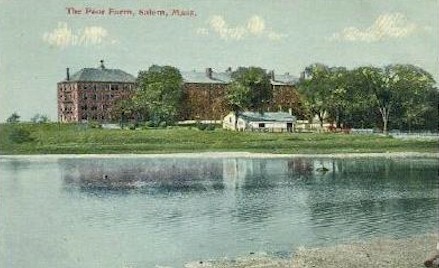 The City Almshouse (and Poor Farm) which stood on Collins Cove, on present day Memorial Drive, for over 140 years, was built in 1816 from plans by Charles Bulfinch. 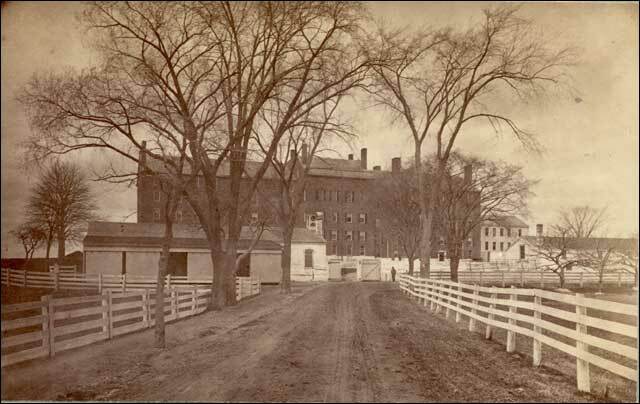 There had been other almshouses in Salem in earlier times, one at the corner of Summer and Broad Streets, and one at the northeast corner of Salem Common. This Alms House (Work House), with a farm surrounding it, reflected the thoughts of the day. According to scholars, the prevailing view espoused by civic and religious leaders was that there were two types of poor: the virtuous and the vicious. The virtuous poor were those who had fallen on hard times through circumstances and no fault of their own. The vicious poor had brought this on themselves through lives of indolence, intemperance and immorality. These definitions also effected the treatment of the poor. The virtuous poor could be handled through outdoor relief where food and fuel could be provided at home by government or charities. The vicious poor, however deserved to get indoor relief where they were placed at the Alms House where there was stringent discipline and hard work to train them in industry. They should not be “taken care of,” lest they continue in their bad habits. Placement in the Alms House was not seen as a pleasant placement in public housing; rather it was more of a sentence to make the person realize the error of his ways. Life at the Alms House was strict with curfews, many rules, and the requirement to work the adjacent farm. Salem’s Overseers of the Poor Committee staffed the Alms house with a Master to ensure good discipline and hopefully profit from the farm produce sold. After its opening, Salem passed an ordinance that all aid recipients must enter the Alms House. The five story brick almshouse could house 100 residents. Over the next several years Salem learned that this system was not working well. During the winter months the Alms house would fill up with residents. When the weather changed, the residents would leave for seasonal jobs just when they were needed for farm labor, forcing the city to hire farm help. The number of large families living in the Alms House further burdened the town, who found themselves paying much more than they anticipated. By 1826, at the Overseer’s request, Salem had returned to “outdoor” aid and no longer placed all aid recipients in the Alms House. 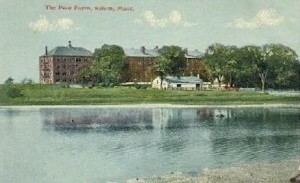 The population at the Alms House continued to grow to 146 by 1883. The adjacent almshouse was razed in 1954. The site is now occupied by a small housing development.